Into a soup pot, add the potatoes and two tablespoons of sea salt. Add enough cold water to just cover the potatoes. Put the pot on high heat. After the water comes to a boil, cook the potatoes until they are “fork tender”. Fork tender means that a fork can easily pierce a piece of potato without resistance. Drain the potatoes in a colander. Into a large mixing bowl, add the red onion, the garlic, the Dijon mustard, the anchovy paste, the red wine vinegar, the black pepper, and two teaspoons of sea salt. Whisk the mixture until well blended. While whisking, slowly drizzle in the olive oil. Continue to whisk until the mixture is smooth and attains the consistency of mayonnaise. Note: If this consistency is not achieved, add Dijon mustard a little at a time until the dressing thickens. Taste and add more sea salt and/or black pepper, if desired. While the potatoes are still warm, add them to the mixing bowl with the dressing. Mix gingerly until all of the pieces of potato are coated with the dressing. Add the hard cooked egg pieces and the parsley. Mix again. Refrigerate for at least 1 1/2 hours before serving. Into a mixing bowl, add the garlic, the red onion, the Dijon mustard, the red wine vinegar, the mint, the oregano, the parsley, the crushed red pepper flakes, the black pepper, and the sea salt. Whisk until all of the ingredients are blended. While whisking, drizzle in the olive oil. Continue to whisk until the dressing is smooth and well blended. Taste and add more sea salt, crushed red pepper flakes, and/or black pepper, if desired. Add the tomatoes, the Italian bread cubes, and the feta cheese to the dressing. Mix gingerly until all of the ingredients are coated with the dressing. Let the salad sit at room temperature for 30 minutes before serving. Into a Dutch oven, add the olive oil, the mushrooms, the celery, the red onion, the green bell pepper, the garlic, the sea salt, and the ground black pepper. Cook on medium heat for 10 minutes stirring occasionally. Add the rice. Stir so that all of the rice grains get coated with the olive oil and the vegetables. Cook for two minutes stirring constantly. Add the chicken stock. Turn the heat up to high. Stir to incorporate the rice with the broth. When the mixture comes to a boil, stir one more time. Cover the Dutch oven with aluminum foil and place the pot into the preheated oven. Cook for 45 minutes until all of the broth is absorbed and the rice grains are tender. Garnish with the parsley and the scallions and serve. Into a flat roasting pan, add the green beans and the olive oil. Toss so that the green beans get coated with the olive oil. Add the red onion, garlic, sea salt, and ground black pepper. Toss again. Place the pan in the preheated oven and cook for 40 minutes. Squeeze lemon juice on the green beans before serving. This pork loin is ever so succulent when slow cooked on a Weber charcoal grill using the indirect cooking method. Into a mixing bowl, add the baby spinach, the scallions, the red onion, the feta cheese, a pinch of sea salt, and a pinch of ground black pepper. Mix well and set aside. With the fat cap up, slice the pork loin about halfway up from bottom but do not slice all the way through the roast. Stop cutting when you are about 1/2 inch from the edge. Open the pork loin up like a book. Using a meat mallet, pound the pork roast until you have achieved a uniform thickness of about 3/4 of an inch. Place the spinach mixture in the middle of the roast. Roll the pork loin up like a jelly roll. Tie the pork loin in three places with the butcher’s twine to keep the roast together and to keep the spinach stuffing from falling out. Sprinkle the fat cap with sea salt, ground black pepper, and dried oregano. Get the charcoal briquets hot. They should be white on the outside and a red, orange color in the center. Place the drip pans in the center of the charcoal grate. Spread the briquets in equal amounts around the drip pans. Place the cooking grate on the grill. Place the pork loin fat cap up on the cooking grate directly over the drip pans. Cover the grill and let the meat cook for at least two hours. Remove the butcher’s twine. Let the roast rest for 15 minutes before carving. Cook the pasta in a pot of boiling, salted water according to the package instructions. Before draining the pasta, reserve one cup of the cooking water. Into a saute pan large enough to hold a pound of pasta and the ricotta cheese, add the olive oil, sea salt, crushed red pepper, and the tomatoes. Cook on medium heat for four minutes. Add the ricotta cheese, the romano cheese, the basil, and the garlic. Stir the mixture well. Add the pasta cooking water. Stir again. Reduce the heat to low and let the sauce simmer uncovered for 5 minutes. After the pasta has drained, add it to the pan with the sauce. Turn the heat up to medium low and cook while stirring for two minutes. Taste and add more sea salt, crushed red pepper, and/or romano cheese, if desired. Turn off the heat and serve. The andouille or chorizo sausage and the “New Orleans trinity” (celery, onion, and green bell pepper) make this dish a winner. The surrounding heat of the oven cooks each rice grain to perfection. Into a Dutch oven, add the olive oil and diced sausage. Cook on medium low heat for 7 minutes stirring occasionally. Turn the heat up to medium high. Add the celery, the onions, the green bell pepper, the tomatoes, the garlic, the sea salt, the oregano, the red cayenne pepper, and the paprika. Cook while stirring frequently for 8 minutes. Add the rice. Cook while stirring for two minutes until the rice grains turn milky white and get coated with the vegetables and the seasonings. Add the chicken stock. Stir one time to incorporate all of the ingredients. Bring the mixture to a boil. Add the red beans. Stir the mixture one more time. 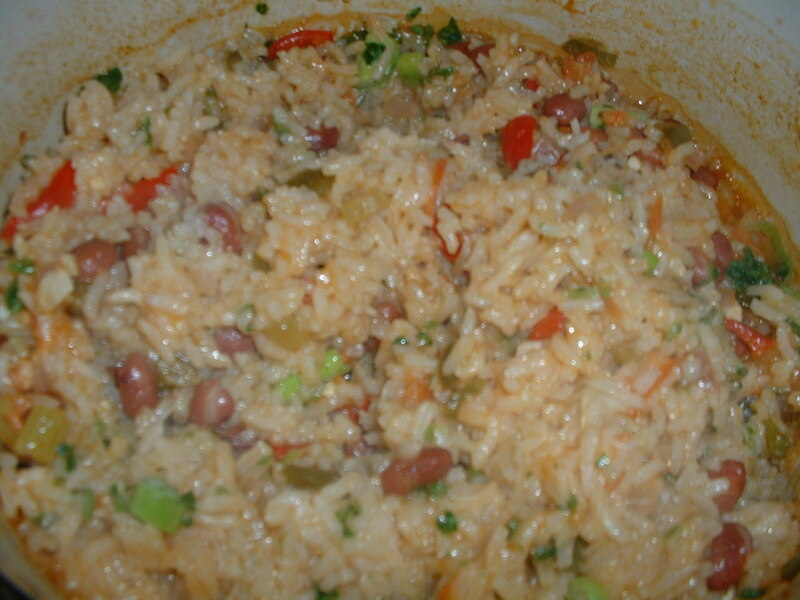 Cover the Dutch oven with aluminum foil and place in the preheated oven for 40-45 minutes until the rice is tender. Garnish with parsley and scallions and serve. 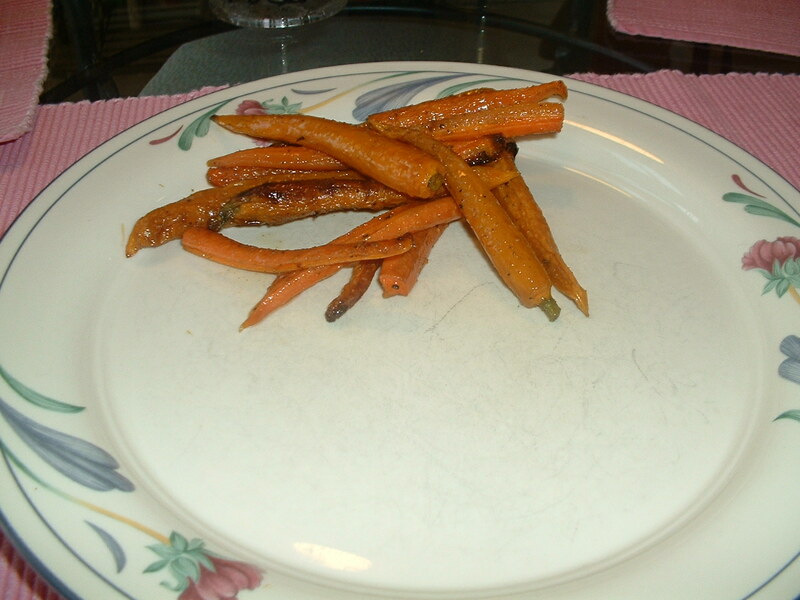 Into a small roasting pan, add the carrots and the olive oil. Stir well to coat the carrots with the olive oil evenly. Add the cumin, sea salt, and ground black pepper. 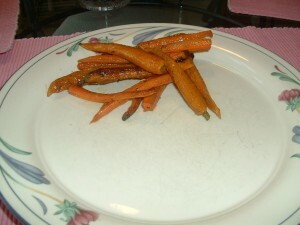 Stir again so that the carrots get coated with the dry seasonings. Roast in the preheated oven for one hour. This recipe has the best results when cooked on a Weber charcoal grill using the indirect cooking method. Add the sea salt, paprika, and red cayenne pepper into a small mixing bowl. Mix well. Sprinkle this seasoning all over the outsides of the chickens. Drink one half of the beer in each can. 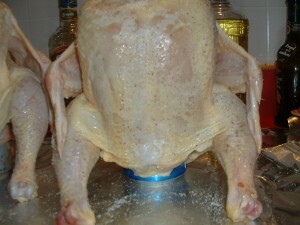 Place the cans into the cavities of the chickens between the legs of the birds. This will create a tripod. 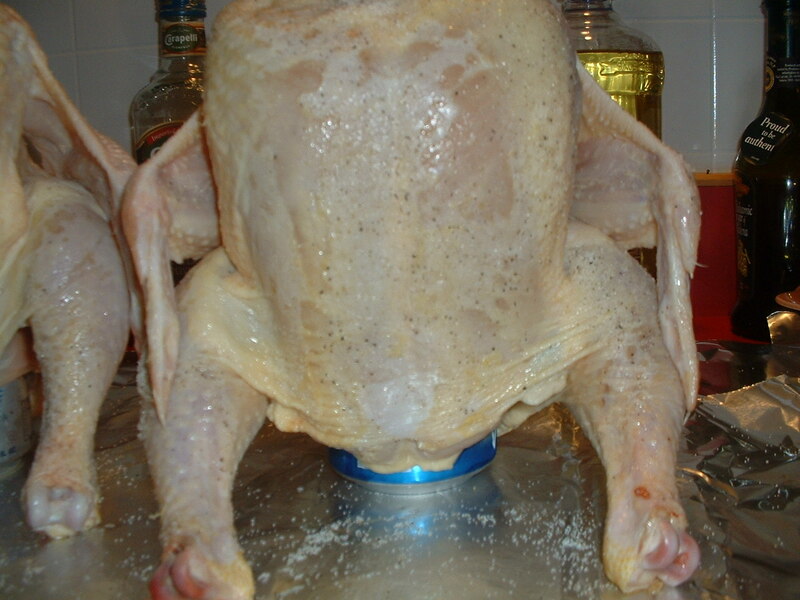 The cans serve as the bases and the chicken legs will be the support. Heat the charcoal briquets until they are white hot. The outside should be white in color and the inside should be a burning red, orange color. Place the drip pans in the center of the charcoal holder. Pile the hot charcoal on each side equally. Place the grate on the grill. Place the chickens in the center of the grate over the drip pans so that the chicken fat is captured by the pans while cooking. Put the lid on the grill and let the chicken cook for two hours. 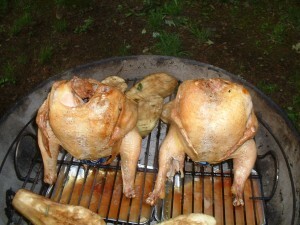 Check the chickens after one hour to make sure that they are cooking evenly. 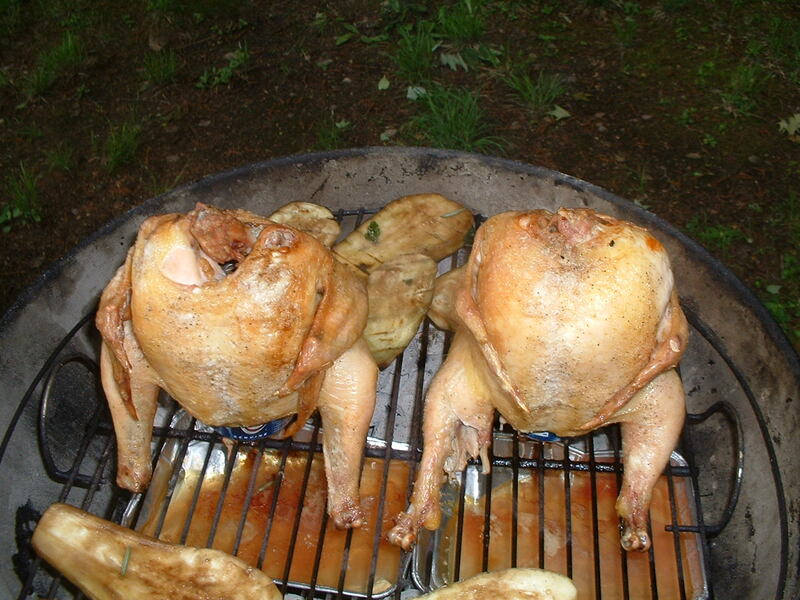 When the chickens are cooked, pull the beer cans out of the chicken cavities with tongs. Let the chicken rest for 10-15 minutes before carving. This sauce is great with eggs, tacos, or echiladas. You can adjust the heat of the sauce to your liking by adding more honey or more red cayenne pepper. Put the dried chile peppers in a bowl. Pour three cups of boiling water over the dried peppers and let them sit for one hour. After an hour, remove the stems and coarsely chop the peppers. Into a sauce pan, add the canola oil, the sea salt, and the red cayenne pepper. Put the saucepan on medium heat. Add the onions, the garlic, and the peppers to the canola oil. Cook while stirring frequently for four minutes. Add the white wine. Cook for an additional four minutes. Add the tomato puree and the chicken stock. Stir well to incorporate all of the ingredients. Reduce the heat to low and simmer the mixture for 25 minutes uncovered stirring occasionally. After 25 minutes, turn off the heat and let the mixture cool for 30 minutes. After the sauce has cooled, add the mixture to a blender. Add the honey, the cumin, and the oregano. Blend until smooth. Taste and add more sea salt, if needed. If the sauce is too spicy or somewhat bitter, add more honey. If you would like a hotter, spicier sauce, add more red cayenne pepper.